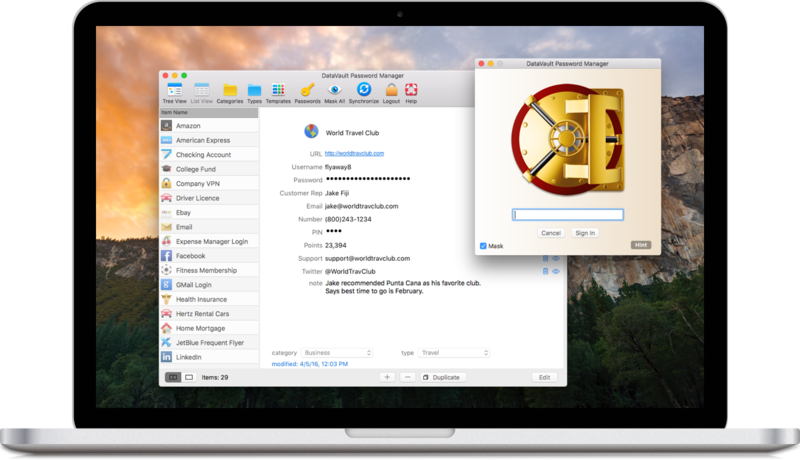 DataVault for Mac is a secure password manager that allows you to store personal information such usernames, passwords, PINs, etc. using Advanced Encryption Standard (AES), the most powerful encryption technology to secure confidential information. Each item you store in DataVault comprises an item name, icon, notes and up to ten additional pieces of information. For example, a credit card item may include fields such as credit card type, number, expiration date, security code, issuing bank, web site address, username, password as well as notes from a recent discussion with customer service. You can change the labels associated with each field to personalize the item's format. Items can be grouped into categories and types so you can organize them in an intuitive way. For example, you might use categories such as Business and Personal and types such Credit Cards, Bank Accounts and Logins. This would allow you to store a company American Express Card with other work-related items and a personal Visa Card along with logins for web sites you use at home. DataVault provides a set of default categories and types but you can add as many as you like and move items from one to another. Templates are used in DataVault to help you enter items quickly and in a consistent manner. You can select a template when you add an item and DataVault will automatically fill the field labels and select the item icon. For maximum flexibility, templates are independent of categories and types. 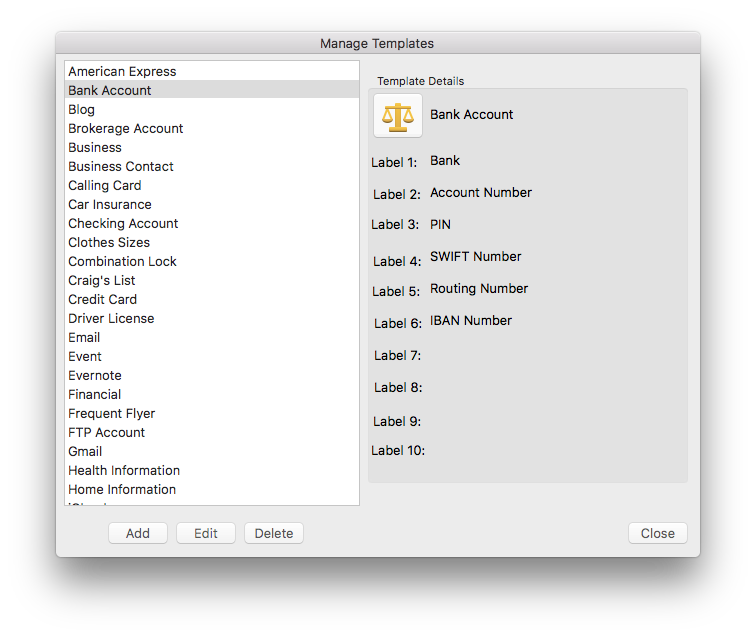 This allows you to use a "Mastercard" template with any category or type. By default, DataVault provides twenty-five templates but you can add as many as you like. The DataVault user interface has been optimized for use with mobile devices while remaining consistent with familiar desktop environments. Items can be displayed in a list or in a tree similar to desktop file managers. List view displays items in alphabetical order. Tree view displays items organized in folders by category and type. You can find items quickly by typing characters into the search field at the top of the main window. The list or tree of items reduces to display only items containing the search string. For users with large numbers of items, searching on a string of characters may be quicker than navigating through a list or tree. DataVault offers the ability to customize search to include field labels, contents or notes and take into account case sensitivity. Numerous security features allow you to personalize how DataVault protects your data. You can enable a security time out to require a log in after an inactivity delay. DataVault also provides field masking, a master password hint and a customizable password generator to help you keep your information safe. DataVault for Mac does more than just store information, it allows you to save forms in an internet browser and auto-fill them at a later time. This can be helpful for entering usernames and passwords to log in to popular web sites. To use these features you will need to install browser extensions as described in the section on Browser Plugin installation. Your Mac isn't the only place you need to use confidential information. For this reason, DataVault for Mac can be synchronized with DataVault for iPhone, iPod Touch & iPad, DataVault for Android and DataVault for Windows (sold separately). DataVault provides several synchronization methods so you can chose the one that best fits your needs. The sections below describe the features of DataVault for Mac in detail. Additional information is available on our Support Page. To install DataVault for Mac version 5 and above from the Mac App Store, simply tap on the Install App button that appears after purchase. DataVault will download to the Mac Launchpad. From there you can drag and drop the app icon to the Mac Doc for easy access. To install DataVault for Mac version 4, follow the instructions on the FAQ page to download DataVaultSetup.pkg then double-click on the filename and follow the prompts. By default, DataVault will be installed in the Mac OS Applications folder. You can select a different folder by clicking on the "Change Install Location ...". During installation, an encrypted file called DataVault.db is created in the Documents folder. You can make a copy of this file to use as a backup. If you erase this file and restart DataVault, a new file will be created with sample items. Once you have completed Installation, you can start DataVault by opening the Applications folder and clicking on DataVault. DataVault for Mac OS version 4 comes with a 30-day trial period during which time you can use the application for free. To use this version of DataVault beyond the trial period, you must enter a registratino key which will be sent by email when you complete the purchase process. When you start DataVault for the first time, you will be prompted to create a master password and an optional hint question. Choose a master password and enter it again to make sure you don't make a mistake, then click on the Ok button. DataVault will display sample items, categories and types in a tree formation, see image below. You can edit or delete these samples at any time. To add an item click on the plus button "+" under the Item Details panel on the right side of the main window. To expand or collapse branches in the tree, click on the folder icons. To collapse or expand all levels in the tree, tap on the Expand All, Collapse All buttons below the tree. To switch between viewing modes, click on the "Tree View" or "List View" buttons in the toolbar. DataVault protects your confidential information by requiring you to enter a master password each time you start the application. The master password is used to encrypt and decrypt your data. When you first start DataVault, you will be prompted to select a master password, then enter it a second time to make sure you don't make a mistake. A stength meter indicates whether the password you select is Weak, Good or Strong. A password less than 8 characters is considered Weak. A password of 8 or more characters including numbers and upper & lower case letters is considered Good. A password greater than 12 characters containing numbers, upper & lower case charcters, and punctuation marks is considered Strong. You can change your master password at any time by selecting Change Password from the File text menu. PLEASE NOTE: It is very important that you store a copy of your master password in a secure place. If you lose you master password, there is no way to get it back. It isn't stored anywhere in the app and even Ascendo is unable to retrieve it. A password hint is an optional security setting that you can use to obtain your master password if you forget it. The password hint consists of a question and answer of your choosing. For example, you might enter "What was my fist telephone number?" as the question and then enter the correct answer to be stored in DataVault. If you forget your master password, you can click on the "Password Hint" button in the login window. DataVault will display the hint question and prompt you for the answer. If you enter the correct answer, your master password will appear. To create an item, click on the plus botton + button under the Item Details panel. You can select a template from the drop down list to automatically choose an item icon and item field labels. When you are done editing, tap on the Save button or Cancel. To modify an item, double-click on the item name in tree or list view (left-hand panel). Alternatively, you can click on the item name to highlight it, then click on the Edit button below the Item Details panel. To change an item icon, click on the icon in the upper-left of the item details form. An icon matrix will appear. Click on an icon to select it and return to the item details form. To modify an item name, field labels, field contents or notes, click on the field and start typing. If you enter a string of characters into the field contents starting with "http://", DataVault will assume it is an internet address (URL). After saving the item, the URL will be displayed as underlined text. This signifies that you can click on the link to open your browser and go to the web page. To use a template, click on the arrows to the right of the template field and select from the drop-down list. Choosing a template will automatically fill the form with a default icon, field labels, category and type. For more information, please see the section on Templates. To choose a category or type, click on he arrows to the right of the field and select from the drop-down list. Selecting a category and type will determine the position of the item in tree view. When you are done editing, click on the Save button below the Item Details panel or click on Cancel. To delete an item, click on the item name in tree or list view then click on the minus button below the Item Details panel. To view items in a tree formation organized by category and type, click on the Tree View button in the toolbar. If the number of items exceeds the screen size, a slider bar will appear to the right of the tree. Use the slider to move up and down the tree. To expand or collapse a level in the tree, click on category or type folders. To expand or collapse all levels in the tree, click on the Expand All or or Collapse All buttons below the tree. You can change the position of types and items using drag and drop. To move a type, click and hold a type folder, drag it over a category and release it. To move an item, click and hold an item, drag it over a type folder and release it. To view items in an alphabetical list, click on the "List View" button in the toolbar. If the number of items exceeds the screen size, a slider bar will appear to the right of the list. Use the slider bar to move up and down the list. Use the horizontal slider bar at the bottom of the list to move across fields. To hide the Item Details panel and maximize the space available to display item fields, click on the Hide Details and Show Details buttons in the lower right of the window, see image below. To find an item, click inside the Search field in the toolbar and begin typing. Each time you type a character, the tree or list of items will reduce to include only items containing the search string. For example if you type car, items such as Mastercard and Car Registration will appear in the list. Clicking on the Escape key will clear the search field and display all items. To add, edit or delete a Category or Type, click on the appropriate button in the toolbar. If you delete a category or type, DataVault will ask you if you want to move the items to the Unfiled folder or delete them permanently. Templates allow you to set default icons and field labels for items that are similar. For example, all credit cards have a number, expiration date and security code. Instead of entering the same field labels each time you create a credit card item, you can select the Credit Card template which will fill the field labels automatically. DataVault comes with a set of 25 pre-defined templates. To add, edit or delete templates click on the Template button in the toolbar and use the buttons along the bottom of the window. 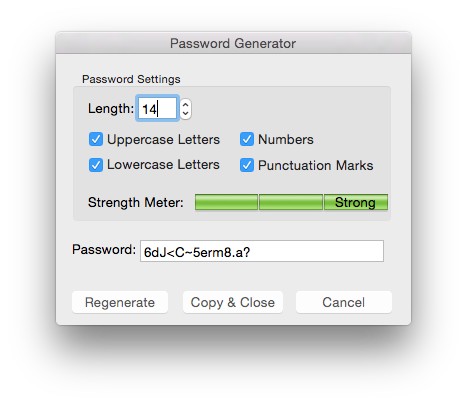 The password generator can be used to suggest new passwords based on user-defined settings, see image below. To invoke the password generator, click on the Passwords button in the toolbar. You can set the length of a password and choose the types of characters it contains. When you have finished choosing password settings, click on the Regenerate button to display a new password. A strength meter displays whether the password is "Weak", "Good" or "Strong". The longer the password and the more types of characters you include, the stronger the password is. When you have created a password that you want to use, click on the "Copy & Close" button to copy the password to the Mac OS clipboard. The password generator window will close and you can click in Command-V to paste the password into an item form. 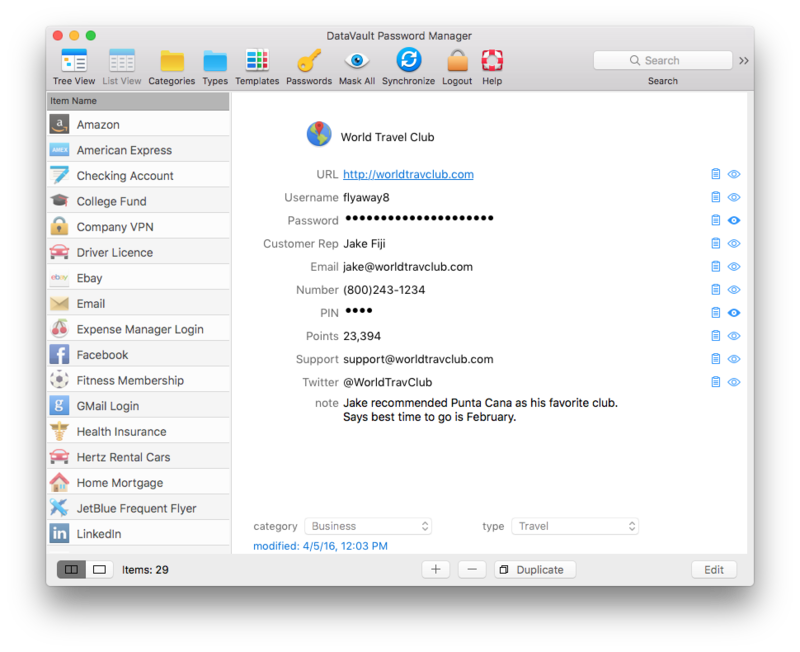 Click on Cancel to close the password generator without copying the password to the Mac OS clipboard. DataVault monitors your usage to determine if there are periods of inactivity that may indicate you stepped away from your computer. After an user selected inactivity delay, DataVault will close the main window and display the master password login window. To set the Security Timeout select Preferences in the DataVault menu bar and set the number of minutes for the inactivity delay. Masking field values displays the characters as stars. You can toggle between "stars" and the the actual field contents by clicking on the eye icon to the right of the field. This can be useful if you are concerned that somebody will see a password while you are using DataVault. To mask a field click on the mask icon to the right of the field value in the item details form. Click once to mask the field and a second time to unmask the field. The Mask button in the toolbar will toggle all masked fields in list view and in the item details form. You can create a secure copy of all the items, categories, types and templates stored in DataVault using the backup feature. You can restore the data from this backup in case your computer is stolen, your hard drive crashes or you change computers. To backup your data, click on the File option in the DataVault menu bar, then select Backup. Your data will be encrypted using your master password. To restore the data, select File > Restore and enter the master password used to backup the data. DataVault for Mac provides settings to manage automatic backups. To access these settings, click on the Preferences from the menu bar, then check off the box marked "Allow Automatic Backups". A backup will be made each time you quit DataVault after having modified information. Each backup will include a timestamp in the file name so you can go back to older backups in case you overwrite important information. DataVault conforms with Apple's App Sandboxing guidelines to protect data against malicious software so the files are not readily available thought Finder. To restore automatic backups, select File > Restore from the menu bar and a dropdown list with recent automatic backups will appear. Automatic backups are stored in a protected folder. To access this folder, start Finder and select Go from the menu. With the Go menu still showing, click on the Mac alt/option key and Library will appear in the menu. Click on Library, then to go Containers/com.ascendo.DataVaultMac/Data/Library/Application Support/DataVault Password Manager/Backups. DataVault for Mac can synchronize items, categories and types with DataVault running on other devices. DataVault implements 2-way synchronization so that all additions, edits and deletions are taken into account regardless of the device on which they are initiated. If the same piece of information is modified on two devices then DataVault prompts the user to choose which version to keep. This is called conflict resolution. To synchronize DataVault between several devices, the passwords on each must be the same. You can verify the password on a device by using the unmask feature before you login. To modify a password select Change Password from the Options menu. Before synchronizing, go to File > Synchronization Settings and select configuration options, see image below. Once configuration is complete, you can click on the Synchronization button in the menu bar to initiate manual synchronization methods such as Wi-Fi. Other methods such as iCloud and Dropbox provide automatic synchronization. Troubleshooting tips can be found in the Frequently Asked Questions pages (FAQs) located on the Support Page. To configure Wi-Fi sync, go to File > Synchronization Settings, select Syncing Using Wi-Fi or Direct Internet Connection and click OK.
Return the main menu and select File > Synchronize. A window will appear indicating the IP address that will be used for synchronization. Now start DataVault on another device and initiate Synchronization using Wi-Fi. Depending on the platform, you should see a screen to initiate synchronization including fields for the IP Address and Port. Verify that these values are the same as in DataVault for Mac or change them if necessary. Do not close the synchronization window until synchronization has completed. Then click on Synchronize Now on both devices. Alternatively, you can enter the IP address before selecting a device on your Wi-Fi network by selecting "Manually". Entering an IP address manually will allow DataVault for iPhone, iPad or iPod Touch to connect to DataVault for Mac over a fixed line (Ethernet) cable but requires your Mac to have a fixed IP address. Devices running iOS version 3.2 or above can use application file sharing to synchronize by following the steps below. Start DataVault on your iOS device and tap on the tools icon, then select Synchronize > File Sharing (iTunes). Connect your iOS device to your desktop with a data cable and start iTunes. Select your iOS device on the left of iTunes, then click on the Apps tab along the top. Move to the bottom of iTunes and click on DataVault in the File Sharing section. Return to your desktop and double-click on DataVaultSyncDataFromDeviceSDCard.dvx. Alternatively, you can start DataVault for Mac, click on File > "Import from DVX" and select the file. An alert will appear asking "Would you like to initiate 2-way synchronization...". Click on Synchronize. If you have chosen to resolve conflicts manually, you will be prompted to choose which versions of items you want to save. Return to iTunes and click on the Add button from the File Sharing section. Select DataVaultSyncDataFromDesktop.dvx from your desktop file system, then sync iTunes to complete the DataVault synchronization process. DataVault for Mac can synchronize with DataVault for iOS, Android and Windows using Dropbox, a popular data storage service. To synchronize using Dropbox you must create a free Dropbox account. Install Dropbox on all devices and follow the steps below. Start by selecting File > Synchronization Settings from the DataVault for Mac menu bar. Select Dropbox and enter your username and password. Then select File > Synchronize from the menu bar. Start DataVault for Android and select Synchronize > Dropbox from the main menu. Tap on Synchronize Now. Start DataVault for iOS, tap on the tools icon, then select Synchronize > Dropbox and login.Tap on Synchronize Now. In DataVault for Windows, select Tools > Synchronization Settings from the menu bar. Select Dropbox and click on the Ok button. DataVault will open the default browser and go to the Dropbox login screen. Login to Dropbox then select the DataVault confirmation window in the task bar and click on OK. Then select File > Synchronize from the DataVault for Windows menu bar. 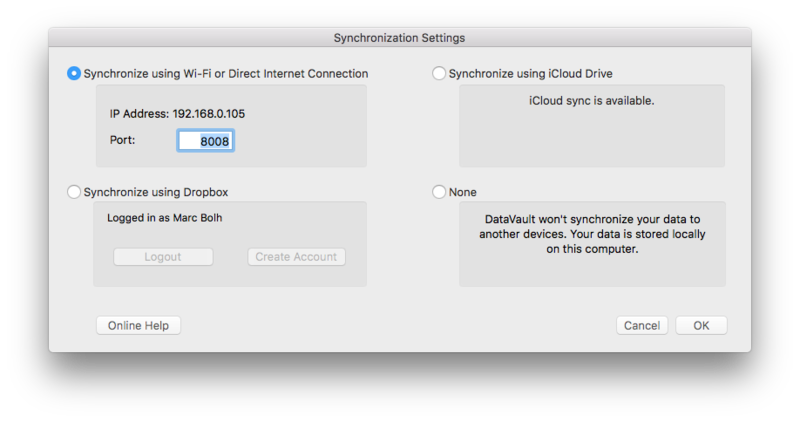 If you purchased DataVault Premium, an option should appear in Settings > Synchronization > Dropbox called "Dropbox auto-sync". If you tap the switch to enable auto-sync, DataVault will keep an encrypted copy of the data file in your Dropbox cloud storage. When auto-sync is enabled on a device, DataVault will automatically check for updates on Dropbox and prompt you to sync if necessary. If you make updates on the device, DataVault will update the data file on Dropbox so other devices can sync with them. DataVault for Mac can synchronize with DataVault for iOS using iCloud or iCloud Drive. However, it is important to note that Synchronizing over iCloud Drive requires iOS 8 and OS X Yosemite. If you upgrade from iCloud to iCloud Drive on one platform but not the other, you will no longer be able to synchronize using iCloud. Developers cannot provide a work around to this limitation so make sure to upgrade on both platforms or use another synchronization method while waiting. Synchronizing over iCloud requires that you have an iCloud account and that you are signed in on all devices, see System Preferences > iCloud on your Mac. Once you have verified this, go to File > Synchronize Settings and select Synchronize using iCloud. On iOS devices, go to Tools & Settings > Synchronization > iCloud and tap on the iCloud Sync switch. Modifications on one device may take several minutes to update on all devices. If you are experiencing delays longer that 10 minutes, click on the Synchronization button in the menu bar to provoke an iCloud synchronization. On iOS devices, go to Settings > Synchronization > iCloud and tap on Sync Now. If you are still having issues, try restarting DataVault on all devices. To synchronize over a Wi-Fi connection, start DataVault for Mac and select File > Synchronize from the menu bar. Then start DataVault for BlackBerry and select Advanced from the main menu. Click on Connection Settings and select Wi-Fi. Now enter the IP Address and click on Connect. To synchronize over email, start DataVault for BlackBerry and select Advanced from the main menu. Select "Sync over Email" then enter your email address and click on Send. When you receive the email, save the attachment to a folder on your hard drive. Start DataVault for Mac, select File > Import from DVX and select the file you sent by email. When the first step in the synchronization has been completed, you will be prompted to send desktop modification back to your BlackBerry by email. Open the email on your Mac and double-click on the attached DVX file. Enter your DataVault master password when prompted. Resolve any conflicts in the data by selecting the versions that you want to keep. DataVault for Mac OS allows you to import and export items in DataVault Exchange format (DVX). To export data from DataVault, click on Tools > Export... in the DataVault text menu. To import a DVX file into DataVault for Mac OS, select File > Import DVX from the text menu. DVX files do not contain category and type information for items. 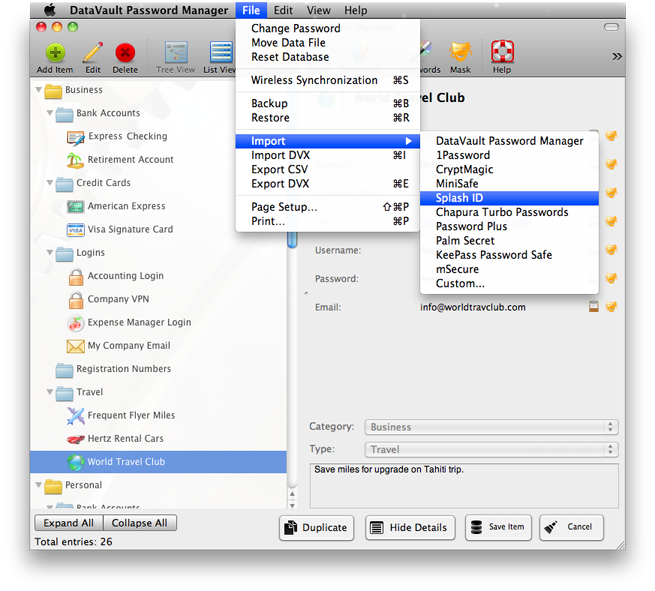 DataVault for Mac allows you to import data directly from the following 3rd party applications: SplashID, mSecure, 1Password, Keepass, Passwords Plus, Turbo Passwords, Cryptmagic and Minisafe. To import data, you will first need to export it from the 3rd party application. Exporting is different for each application but in general you should select a text delimited format such as comma separated values (CSV). Then select File > Import from the DataVault for Mac menu bar and choose the application you want to import from (see image below). Browse to the file location and select the file. More detailed instructions for importing data into DataVault can be found for SplashID, mSecure, and 1Password. Please check our Support Page for further information, a troubleshooting FAQ and contact information for technical support.